It’s been another great week on the Treasury Career Corner podcast. This week I’m delighted to welcome Conor Maher, the Head of Cash & Liquidity Product Management for RBS, a UK-based banking and financial services company, headquartered in Edinburgh. Conor is an accomplished treasury professional, having spent seven years as Head of Treasury Operations for Europe, the Middle East, Latin America and Canada at Hewlett-Packard. He joined RBS in October 2009 from Barclays where he spent 18 months building an international liquidity product capability. Conor has an economics degree from University College Dublin and is a Fellow of The Association of Corporate Treasurers. 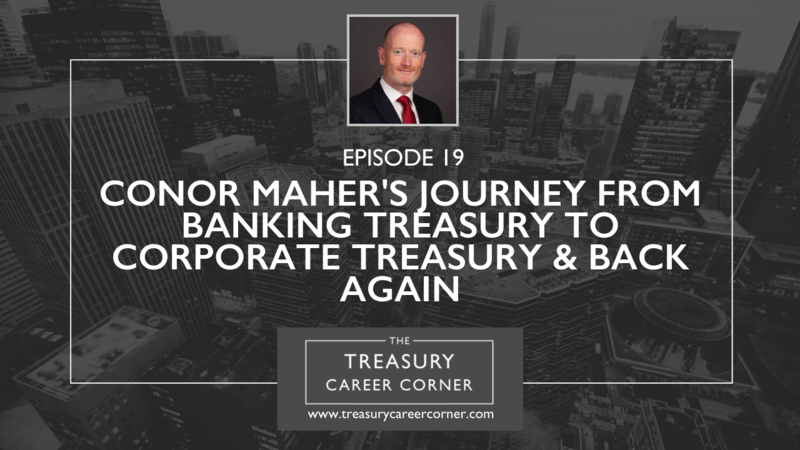 I thoroughly enjoyed my conversation with Conor as we explored his journey in banking and corporate treasury. The Treasury set up within Hewlett-Packard and his progression from Treasury Consultant, EMEA through to Head of Treasury Services – EMEA, LatAM and Canada. Conor’s experience of working for SCF Capital Inc, a new start-up business. The benefits of gaining treasury exams and qualifications and how this has helped support his career. If you’d like to get in touch with Conor Maher, you can reach out to him via his LinkedIn profile.